This year's family trip was a week-long trek to Wisconsin. My wife and I both wanted to go. I have heard how nice Madison is plus this was a chance to go the EAA AirVenture museum at Oshkosh. 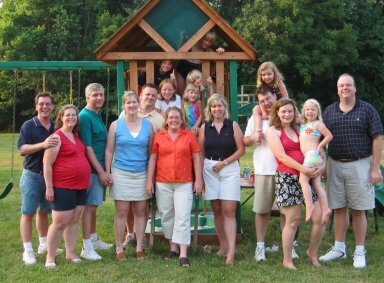 My wife has family from the area and used to vacation there as a child so she was game. As it turned out it was a nice trip but quite a drive at 1700 miles. The plan was to drive to Dayton (to drop the dog off with my parents) then to Madison via Indianapolis and Chicago. Except for the hellhole that is Chicago it was a nice drive. We stayed right downtown in Madison within walking distance of the very impressive statehouse. 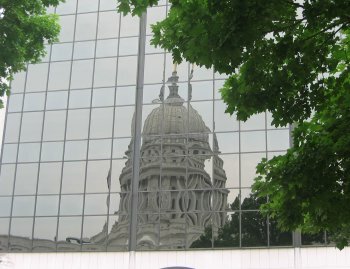 At right is an artsy-fartsy shot I took of the Statehouse reflected in a building. We spent some time people watching on the State Street Mall which sort of runs between the University of Wisconsin campus and the Capitol. It is closed to most traffic and is full of shops, bars, restaurants, and all sorts of people doing all kinds of things. We also hit the Henry Villas Zoo which was small but very nice (and free!). In the park that surrounds the zoo we saw our first speed-skating track (a pond in summer) and Maria spotted a wild river otter. The next day we toured the Wisconsin Veterans Museum. The museum was very nice but too dark for good photos. After lunch we took a tour of the statehouse. I am not sure what happened but according to the guide there are usually ten or so people on the tour. We had more than 60 and it seemed we had more than the usual number of rude people and idiots. Whoever said there is "no such thing as a stupid question" should have been on the tour. However our guide did the best she could to keep things together and convince some moron that a lady in a wheelchair really did have to wait for the elevator (seriously!). The Statehouse itself is a really impressive building. One sign said that it was the 4th largest free-standing dome in the world. I can believe that. 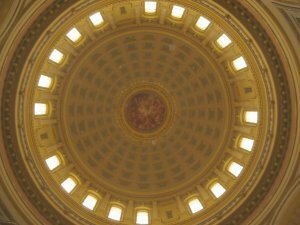 This picture was taken by my 7-year old laying on her back under the center of the dome. What you see is actually the INNER dome. The outer dome is a good deal higher. To give a sense of scale that gold ring around the painting at the top of the dome is actually a balcony and railing. The entire place was decorated with different types of artwork. Marble from all over the world covered the walls. Very impressive! 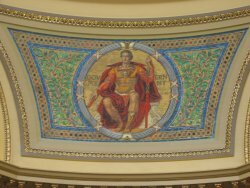 At right is one of the mosaics that surround the bottom of the dome. According to the tour guide the place is insured for 1 billion dollars. I bet that could not cover the cost of replacement. Ironically this statehouse was built because the last one burned down after the legislature canceled their insurance policy. After a couple days in Madison we headed up towards Wausau. On the way we detoured to North Freedom which has less than 1000 people but also contains the Mid-Continent Railroad Museum. This treasure trove contains the largest collection of vintage rolling stock and equipment I have ever seen. We took a ride in a ca. 1915 passenger coach being pulled by a 1944 diesel switcher engine. The conductor took the picture at left during the ride. 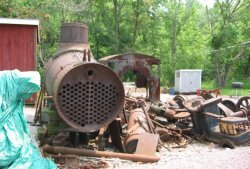 They have several steam engines in various stages of restoration and repair and hope to be running these train rides under steam power soon. Besides the museum proper there are acres of rolling stock and equipment on sidings behind the car sheds. Here are a row of restored wooden cabooses (caboosi?). 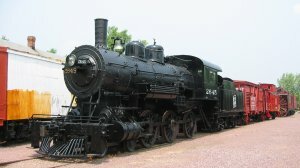 There were several engines from a small track maintenance car to some gorgeous steam engines like the 1-4-0 at left. Less pretty but still fascinating were the heaps of bits and pieces laying around. Here at right is one pile that used to be a locomotive. At Wausau we visited Maria's old hangouts. 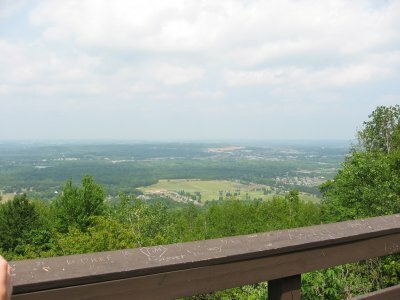 Rib Mountain State Park has both the highest point and the most annoying flies in Wisconsin. The views are impressive and the quartzite rock is 3 billion years old (some of the oldest exposed rock in the world). It was strange to see patterns in the rock from waves that washed sandy beaches billions of years ago. We also visited the Yawkey House. 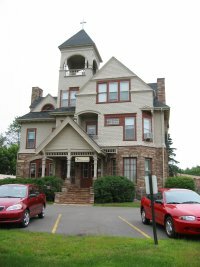 This mansion was built by the Wausau lumber baron who founded Wausau Insurance. We also searched the archives of the Marathon County Historical Society for Maria's relatives. They were quite helpful. We found her maternal grandfather's business address (he was a dentist) and pictures of her great-grandfather A.J. 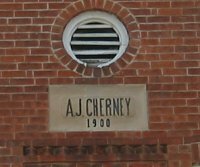 Cherney (who seemed to be the Marathon Co. equivalent of Boss Hog). Over the next day or so we visited Edgar, WI and almost immediately found the building at left. Pretty cool! We also trucked up to Merrill, WI to visit the convent that Maria and her 9 brothers and sisters used to visit as kids. The convent runs the local hospital and is undergoing extensive renovation. The house at right is now an administration building. Merrill was the northernmost point on our trip. We departed there and headed south to Oshkosh. Oshkosh sits along lake Winnebago. Besides children's clothes and really big 4WD trucks Oshkosh is also home to the Experimental Aircraft Association (EAA) and their AirVenture Museum. 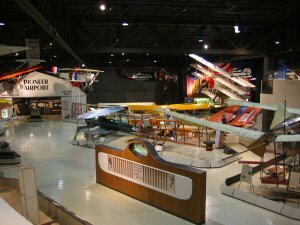 This is one of the finest aviation museums in the world and one of the few places where you can get a ride in several unique vintage aircraft such as the Ford Trimotor. Every year Oshkosh is host to the largest airshow in the world. Literally thousands of airplanes and hundreds of thousands of people attend. We missed the show by a month but enjoyed the heck out of the museum. One of the missions of the EAA is to promote aviation as a hobby and career. 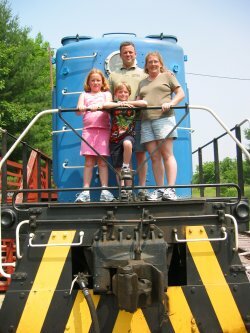 Special attention is paid to exhibits geared towards kids. We all had fun with the hang glider simulator and the kids spent all kinds of time in the hands-on exhibits.